Free Speech For People has filed a complaint with the Federal Election Commission against the oil company Citgo, the Venezuelan state-owned oil company that owns and controls Citgo, and President Trump’s inaugural committee. The complaint alleges that the companies and the inaugural committee violated a federal ban on donations to inaugural committees by foreign nationals. Last week, contribution records from Trump’s inaugural committee, released by the Federal Election Commission, showed that the president who once rallied against the corrupting influence of big money in politics had no hesitations accepting major donations to his swearing-in ceremony. In particular, the records revealed that Citgo, a wholly-owned subsidiary of the Venezuelan state oil company, made a $500,000 contribution to President Trump’s inaugural committee. Citgo Petroleum Corporation (Citgo) is an energy company, founded in Oklahoma in 1910 and now headquartered in Texas, with some 3,500 employees. Citgo is also an iconic American brand. 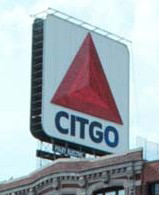 Its famous triangular logo is seen around the United States, and is a major landmark in Boston’s Kenmore Square. But Citgo has not been under American ownership or control for a generation. Since 1990, Citgo has been a wholly-owned subsidiary of Petróleos de Venezuela, S.A. (PDVSA), a Venezuelan state-owned oil company. PDVSA, and the Venezuelan government, have long used Citgo for political purposes in the United States. There’s even a Russia angle to this—Venezuela’s state oil company is flailing, and pledged 49.9% of its own stock as collateral for a loan from Rosneft, a Russian oil company controlled by the Russian government, and given the Venezuelan company’s precarious finances, it’s in danger of being taken over by Rosneft. The plot thickens. Foreign-influenced corporate political spending is a rising risk to our democracy and self-government. Until 2010, corporations were prohibited from spending money to influence federal (and many state and local) elections. The Supreme Court’s Citizens United decision changed that, and opened the door to foreign interests using the leverage of corporate treasuries to influence our democracy. In places like Connecticut and St. Petersburg, Florida, Free Speech For People has been working to push back against foreign-influenced corporate political spending. The Supreme Court has, even after Citizens United, upheld bans on political spending by foreign interests. And we have reason to believe that one or more Supreme Court Justices from the Citizens United majority would vote to uphold these provisions. This Citgo donation is a particularly stark example of the problem. Federal law prohibits “foreign nationals” from donating to presidential inaugural committees. In fact, this is the only limit on donations to presidential inaugural committees. If the Venezuelan government isn’t allowed to donate directly to Trump’s inaugural committee, then it shouldn’t be able to make that same donation through Citgo. And while in certain other circumstances the FEC has allowed domestic subsidiaries of foreign corporations to spend money in elections if only U.S. citizens are involved in the decision-making (a loophole opened before Citizens United that should be closed), that doesn’t seem to be the case here. That’s why we filed an FEC complaint that alleges that Citgo, its Venezuelan state-run parent company, and President Trump’s inaugural committee have violated the law through this donation. Check back in for updates and additional information on this complaint. This entry was posted in Uncategorized and tagged citizens united, Foreign Political Spending, Ron Fein.